My childhood memories of cinnamon rolls and sweet breads are associated with holidays and special occasions. My mom would prepare the tasty treats in a pan the night before. The first riser was responsible for turning on the oven in the morning. Making these kinds of treats from scratch may seem daunting, but I wanted to share a few secrets for making the process more breezy. This is the same base recipe I use for Honey Fig Jam Rolls. It’s a nice, quick sweet roll recipe that is about 1 hour to make from start to finish. Perhaps you have many other things to coordinate, though. Cinnamon rolls are quite forgiving. Below are a few ways you could make these work for your situation. Refrigerate for the last rise, bake in the morning. You can prepare them up to the point of the final rise – getting them cut and into a pan. Allow them to rise in the refrigerator overnight and bake the next morning. Rise and freeze to bake later. Allow them to rise and then freeze for later. Bake, freeze, then warm to serve. Follow the whole recipe and do a shortened bake ahead of time and freeze for later. Then all you need to do is to warm and add your topping. With some manageable preparation options you can surprise guests and include from-scratch sweet rolls on your brunch menu. These cinnamon rolls go above and beyond with a satisfying inclusion of fresh orange and a healthy drizzling of maple icing. Hope you have a chance to make these real soon. We would love to see photos of your results – tag Mama Sparrow on your social media shares. 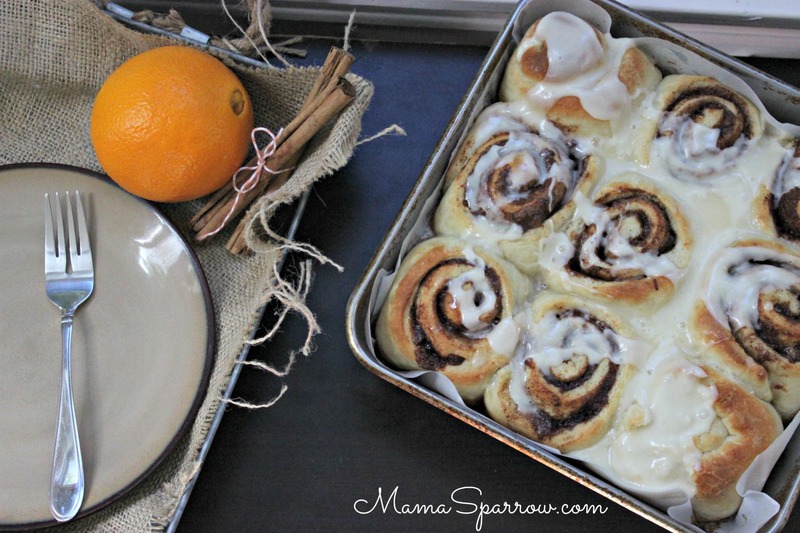 Sweet, orange kissed cinnamon rolls drizzled with a maple-orange icing. Preheat the oven to 200 degrees F. Mix the orange zest, brown sugar, and cinnamon together in a small bowl. Set aside. After the dough has rested, roll it out on a lightly floured surface or silpat mat, shaping dough into a rectangle about 9x15 inches. Spread the melted butter over the dough. * Then spread the brown sugar cinnamon mix over top the butter on the dough. Leave 1 inch without filling on one of the long sides of the rectangle; this will be the seam. Starting at the long, not seam side, begin rolling the dough jelly roll style. End the log roll with the seam side down. Use a sharp, floured knife to cut the log into 9 sections to make rolls. To make topping, combine sugar and orange juice in a bowl. Whisk together and add in maple syrup. Adjust ingredients to desired consistency and taste. *For cinnamon rolls, I usually reserve ⅓ or ¼ of the melted butter to pour over the rolls after they have risen, just before baking. The rolls tend to be a bit more tender and the sugar near the bottom of them caramelizes. In Breakfast, Recipes Tagged nut free, sesame free Bookmark the permalink.